Have you ever been lucky enough to see the London Harness Horse Parade? Rich in history and tradition, the parade showcases horses and drivers in their best Easter turnouts. The London Harness Horse Parade takes place annually each Easter Monday. Today’s London Harness Horse Parade is a combination of two separate parades that were once held – the London Cart Horse Parade began in 1885, and the London Van Horse Parade followed it in 1904. The London Cart Horse Parade was originally created to draw attention to the working horses of London, increasing the public’s awareness of and interest in the welfare of the horses. One hundred and two horses participated in the first Cart Horse Parade, and entries into the next year’s parade jumped to 383. During the early 1900s the parade became so popular that entries had to be limited to 1,000, but with the development of motorized transportation, the role of the cart and working horse soon decreased. The Van Horse Parade was begun for reasons similar to those of the Cart Horse Parade – its goal was to improve the welfare and support of the working horse. Begun in 1904, it was held annually until 1966. It featured working horses and gained great popularity, especially during the early 1900s. But attendance of the Van Horse Parade, too, gradually diminished, and in 1966 the London Harness Horse Parade was created to replace the Van Horse Parade and the Cart Horse Parade with a single event. Today the London Harness Horse Parade hosts a wide variety of breeds, including Dutch Friesians, Gelderlanders, Shires, and even donkeys. Some of the horses and turnouts come from working establishments, such as breweries. The parade is now open to private owners and drivers, so many of the exhibitors drive their horses for pleasure and entertainment. Some participants even come from as far away as Ireland. If you attend the London Harness Horse Parade, you will be treated to a wide variety of horses and drivers, all dressed up and presented at their very best. You may see carts, buggies, and wagons that are brand-new, while others may seem like they are straight out of history. Many paradegoers make it a habit of joining in the festivities by dressing up themselves. 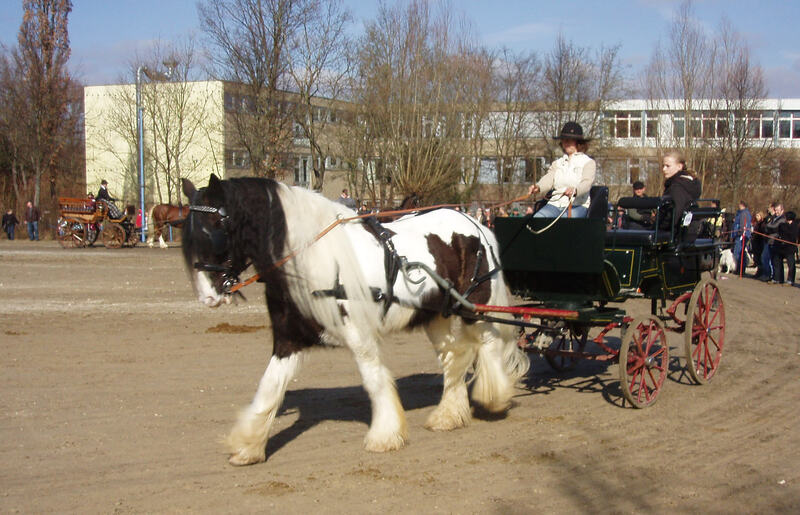 The London Harness Horse Parade of today is no longer held in London; now it is held at the South of England Showground. Still, it has evolved from the traditional parades of London, and continues to draw great attendance. This year’s parade will be held on Monday, April 21st. For more information about the London Harness Horse Parade, visit the London Harness Horse Parade’s website. This entry was posted in Horse Travel. Bookmark the permalink. « Will You Be Attending the 140th Kentucky Derby?